This is a very fun trail, VERY rocky/technical at times both up and downhill. If you don't like rocks, avoid this trail! If you enjoy a technical challenge, do it! These directions are for the route I took and what the Falcon Guide told me to do(not copied straight from the book), riding this trail backwords from this description should be a good ride too. Continue along South St Vrain creek down trail 909, through some very technical/steep climbing, some of it I'm pretty sure you'll have to walk too. Don't go left over the river, go straight up the road. Theres a short uphill on the kinda rocky road. a trail going STEEP up to the right. The trail is marked with an arrow, no trail name. Carry your bike up this trail, not to worry theres not much hiking here. Everything past this is ridable, shouldn't have to walk your bike anymore for the rest of the ride. continue towards the left down a rocky trail. At the next junction, you'll see a sign for Sourdough trail 835 going right. junctions, just follow the signs to stay on 835.
some nice views, after a while you'll hit a wide open area with a big trailhead sign with a map and everything. You can follow the dirt road back downhill to where you started, there's only one intersection you veer right on. double check the map at this point to be sure. the south, so good luck and enjoy. A detailed map of the area or the Falcon Guides mountain biking book would be good to have with you. Review: Another great trail for the area! I remember riding this when I first moved to Colorado in 1994 and had a crappy old Trek... it killed me, but was a blast! It was definitely more fun once my skills improved and I had a better bike. It is a great place to bike, and hike, and sometimes hiking with your bike. I did find that sometimes there were just too many cars in the lot and I'd avoid the crowds and go to less populated trails. Review: Whoa! I love to battle & this trail is a good fight all the way through. Now I'm going to be bored riding any that flows. Review: My new favorite trail in the Front Range. Real technical, tons of rock gardens, a few super steep techie spots, all around awesome. Haven't been that technically challenged in a while. Did it once as a shuttle from Brainard Lake, then rode up to Beaver Res, down Sourdough, around Wapiti, and back down South St Vrain. Amazing trail! Review: As a straight out-and back, this ride is about 12 miles. But there's no need to do that, or the Falcon Guide route either. There are a multitude of loop options; you can hook up with Sourdough, Waldrop, Little Raven, Coney Flats, Buchanan Pass, and a number of FS roads. Be adventurous and be creative. Be advised, however, no matter what route you choose, you will be faced with tough climbs, seemingly endless rock gardens, and you will hike your bike more than once. Similar Trail: SSV is great, but Buchanan Pass is still my fave. Review: Park at the S St. Vrain trailhead ride up the rode to the first fork (96j on google maps) go left follow rode up about 1 mile you will see beaver bog trailhead on the sourdough trail. follow this about 4ish mile to the S St vrain trail and follow it down. when it dumps out onto a road go straight at the fork (DONT go over the bridge). Lower your seat and have fun on some really fun singletrack. Review: BTW this trail, like Sourdough, probably won't be ride-able until late June. 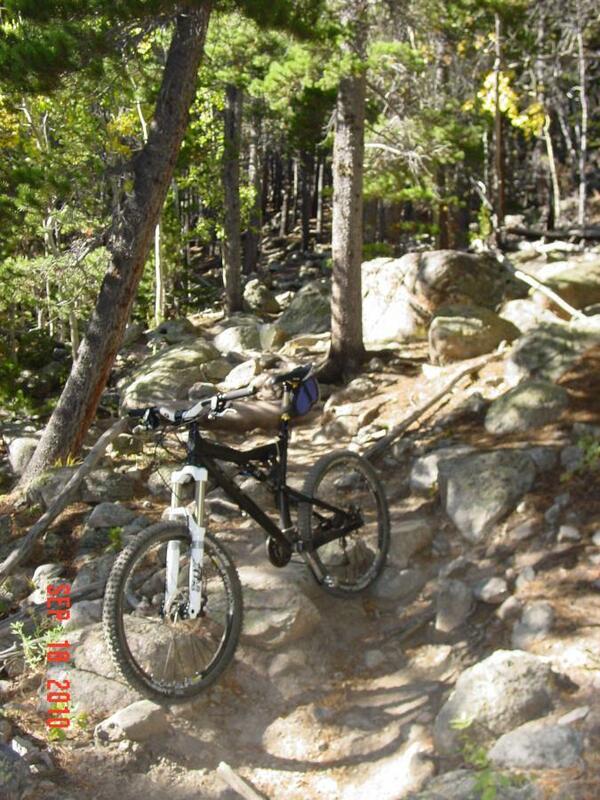 South Saint Vrain MTB Trail 4.50 out of 5 based on 8 ratings. 8 user reviews.